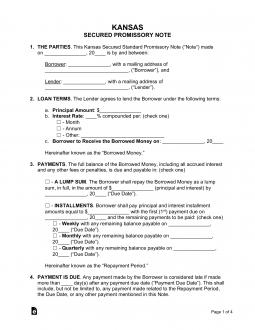 The Kansas promissory note templates are a set of documents used as a written promise to help protect a lender and ensure his or her loaned money is reimbursed in a timely fashion. It is important that a legal interest rate (usury rate), is selected for the note. To find the usury rate of Kansas, check Kansas Statutes Chapter 16-207 which is described below. Secured Promissory Note – Protects the lender by requiring the borrower to set aside security, which consists of an item such as a home, vehicle, or boat. In the case of a default on the balance, the lender is granted the items put into security to help cover the cost of the unpaid balance. Unsecured Promissory Note – Far riskier to the lender than the secured version, the unsecured promissory note does not give the lender security. If a default were to occur, the lender would not have a solid plan for obtaining the money on the note.